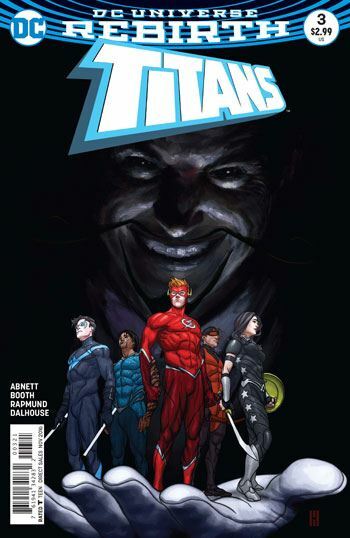 You get the feeling Titans 3 was a lot of fun for Abnett, Booth and Rapmund to create. It’s certainly a lot of fun to read. The story concludes the first battle between Abra Kadabra and the Titans, and gives a breather to each side. Kadabra consults with the magical duplicates of the team that he created, to learn what he can about them. And the Titans try to understand how and why Kadabra has played with their minds so much. If, indeed, it is Abra Kadabra who is the real adversary. There are some hints indicating he is merely exploiting a larger situation. Like the blood stain on the watch. Vibrant art and enjoyable conversations carry this issue easily. Mal Duncan and Karen Beecher, who were both integral to Titans Hunt, are brought back in this issue, albeit in a subplot. Sadly, though the cover shows Karen in the Bumblebee outfit, in this issue the two of them are at home in normal clothes. Still, it's a clear indication of what is to come! And the relationship between Wonder Girl and Arsenal, which has been so varied and complex over their many years on the team(s), gets some development in this issue as well. As in the earlier issues, Wally West remains at the core of the story, and has a meeting with Linda Park in this one, in which he tries to connect with her, without terrorizing her. It’s a very well written conversation, with a deadly kicker at the end.